So you feel like you’ve started late? What if I told you that right now as you flip through this book, 70% of the people in the store with you are living paycheck to paycheck? What if I told you that the man browsing the aisle to your left owes more than $8,000 in credit card debt? And the woman on your right has less than $1,000 in savings? See? You’re really not alone. Unfortunately, the vast majority of people who’ve saved too little and borrowed too much will never catch up financially. Why? Because they don’t know how. You can start late and finish rich—but you need a plan. This book contains the plan. It’s inspiring, easy to follow, and is based on proven financial principles. Building a secure financial future for yourself isn’t something you can do overnight. It will take time and it will take work. But you can do it. I know. I’ve helped millions of people get their financial lives together—and I can help you. Spend a few hours with me—and let me challenge you. Give me a chance to become your coach. Just because you started late doesn’t mean you are doomed to an uncertain future. Whether you’re in your thirties, forties, fifties, or beyond, there is still time to turn things around. It’s never too late to live and finish rich. All it takes is the decision to start. Is it too late for me to get rich? There IS hope, and help is here at last! 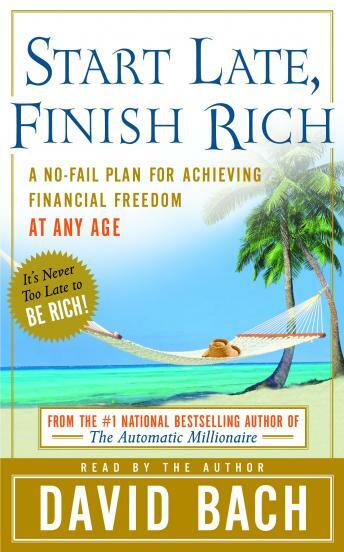 In Start Late, Finish Rich, David Bach takes the “Finish Rich” wisdom that has already helped millions of people and tailors it specifically to all of us who forgot to save, procrastinated, or got sidetracked by life’s unexpected challenges. Whether you are in your thirties, forties, fifties, or even older, Bach shows that you really can start late and still live and finish rich – and you can get your plan in place fast. In a motivating, swift read you learn how to ramp up the road to financial security with the principles of spend less, save more, make more – and most important, LIVE MORE. And he gives you the time tested plan to do it. Even if you are buried in debt – there is still hope. You can get rich in real estate – by starting small. Find your “Latte Factor” – and turbo charge it to save money you didn’t know you had. You can start a business on the side – while you keep your old job and continue earning a paycheck. You can spend less, save more and make more – and it doesn’t have to hurt. David Bach gives you step-by-step instructions, worksheets, phone numbers and website addresses --everything you need to put your Start Late plan into place right away. And he shares the stories of ordinary Americans who have turned their lives around, at thirty, forty, fifty, even sixty years of age, and are now financially free. They did it, and now it’s your turn. With David Bach at your side, it’s never too late to change your financial destiny. It’s never too late to live your dreams. It’s never too late to be free.